As a quality control solution for images and vector graphic files, Graphic Inspector can check entire folders of files for potential problems according to specific workflow requirements. The software provides graphic professionals with the most exhaustive info on multiple images and Adobe Illustrator files, saving the time and hassle of checking each of them manually. The new version lets users open files with an editor app of their choice directly from Graphic Inspector via the new Open With contextual menu. In previous versions only default program assigned by the operating system could be used. The update also introduces background rendering of icon preview images, which speeds up performance significantly especially when scanning a large number of files. I'm surprised no one else thought of it before: to display every bit of useful information about vector or raster graphic files and flag the ones that match rules you define ... With its combination of price, utility, and thoughtful design, Graphic Inspector is a rare gem. 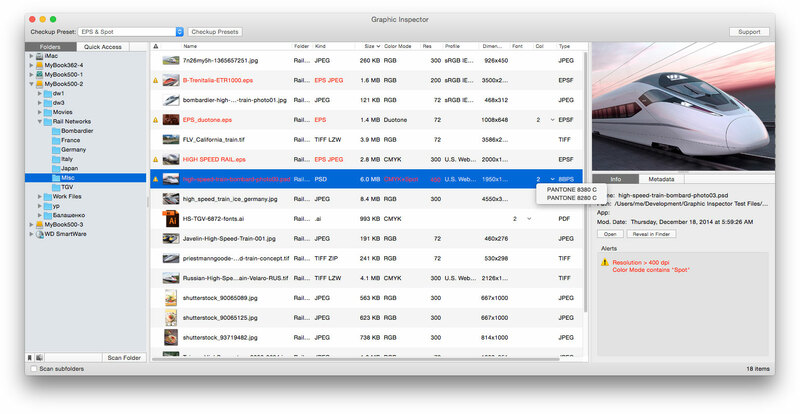 Graphic Inspector is designed to help users of any trade, whether it's print, prepress, web design, electronic publishing or digital photography by quickly locating files with specific attributes. For example, users can flag files whose color mode is CMYK, format - TIFF, resolution is below 300 dpi, ICC profile isn't "US Web Coated" and so on. Graphic Inspector can be purchased from the Zevrix web site for $19.95 (USD), as well as from authorized resellers. Graphic Inspector is free with purchase of PDF Checkpoint or InPreflight Pro for Adobe InDesign. Trial is also available for download. The update is free for users of previous versions. Graphic Inspector requires macOS 10.5-10.12 (some features require OS X 10.7 or later). Toronto (ON) Canada - Located in Toronto, Canada, Zevrix Solutions provides automation and productivity solutions for Adobe Creative Cloud and Creative Suite software, PDF workflows, graphic file diagnostics and Microsoft Office output on Mac OS. Zevrix is dedicated to help professionals increase their profits through automating everyday tasks, producing error-free documents, saving disk space and cutting production costs. For more information, visit their website. Copyright (C) 2017 Zevrix Solutions. All Rights Reserved. Other trademarks and registered trademarks may be the property of their respective owners. Jay Nelson endorses this product, and he'll be the first to tell you he knows what he's talking about!